It has been long been known that bacteria swim by rotating their tail-like structure called the flagellum. (See the swimming bacteria in the figure.) The rotating motion of the flagellum is powered by a molecular engine located at the base of the flagellum. 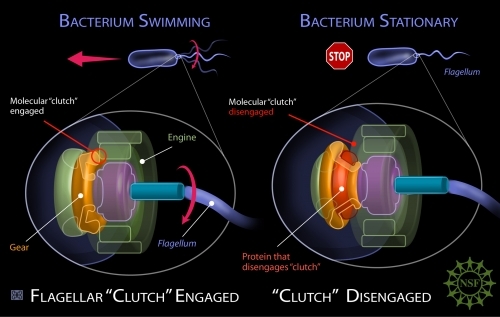 Just as engaging the clutch of a car connects its gear to its engine and delivers power to its wheels, engaging the molecular clutch of a bacterium connects its gear to its engine and delivers power to its flagellum. Now, a paper appearing in the June 20 issue of Science describes, for the first time, how the flagellum's rotations are stopped so that bacteria stop moving. Here's how the stopping mechanism works: while a bacterium is swimming, it releases a protein (shown in red in the stationary bacterium in the figure) that flows between its gear and engine. The presence of this protein detaches the bacterium's gear from its engine and thereby stops the delivery of power to its flagellum. This process is analogous to disengaging the clutch of a car, which detaches its gear from its engine and thereby stops the delivery of power to its wheels. Once the delivery of power to bacterium's flagellum stops, the flagellum stops rotating, and the bacterium's swimming ends. An improved understanding of how flagella work may give nanotechnologists ideas about how to regulate tiny engines of their own creation. The flagellum is one of nature's smallest and most powerful motors. The flagellum of some bacteria can, for example, rotate more than 200 times per second, driven by 1,400 piconewton-nanometres of torque. That's quite a bit of (miniature) horsepower for a machine whose width stretches only a few dozen nanometres. The research team was led by Kris Blair of the University of Indiana and included Daniel Kearns of the University of Indiana and Linda Turner and Howard Berg of Harvard University. Their study was funded by the National Science Foundation and the National Institutes of Health. IMAGE: Swimming helps bacteria look for food, escape bad conditions and disperse their genes. But when a bacterium needs to stop swimming, it produces a free-floating clutch (a protein shown in red), that sits down on a gear-like ring (orange), moving that gear away from the engine that spins the bacterium's flagellum. By disengaging the engine from the flagellum's other moving parts, the flagellum's tail is no longer driven to spin.